Pawsitive Impressions: NEIGHBORLY, PET-CENTRIC Delaware, Ohio Team Members Goes the Extra Mile to Find Neighbor an A-DOG-Able Outfit! NEIGHBORLY, PET-CENTRIC Delaware, Ohio Team Members Goes the Extra Mile to Find Neighbor an A-DOG-Able Outfit! I asked Taylor H. (I believe "H" the initial of her last name) for some help with dog outfits. She stopped what she was doing, and immediately went to work to help me find the cute dog costume I wanted in the right size for my little Havanese. Taylor told me that the store had just gotten a new box of dog clothes that were still in an unopened box in the back. She ran to the back, cut it open, and helped me search for something adorable to buy my little dog. Although we never found that EXACT original outfit, I left the store with something even cuter thanks to Taylor H.! I should probably mention I walked in the store intending to buy just a collar and a leash. I ended up buying so much more due to Taylor's great service and your great selections. I've been a dog owner for nearly 15 years, and have shopped for dog supplies at ALL of the "big box" pet retailers, small pet boutiques, and even several apps and websites over the years. 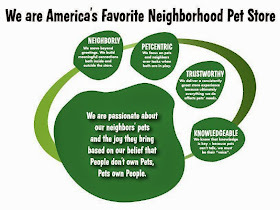 I'm absolutely a loyal Pet Supplies Plus customer after my experience today with Taylor H.